The idea behind mastering is a sort of fine-tuning of the completed mix, typically including bus compression (to even out volumes of mix elements and “glue” things together), EQ for tonal sculpting, and a final limiter or volume maximizer for impact. Some engineers like to put the EQ before the bus compressor, but personally I feel the EQ can really affect the action of the compressor – specifically, boosting bass EQ can cause the compressor to “work” a lot more which can wreak havoc with the rest of the mix. In the pop-up window, click <Select An Effect> (which conveniently rhymes). 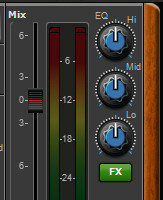 Here you’ll see Classic Compressor in the VST effects list. Super Mixcraft ninja trick: once you have the insert effects for a channel set up, you can skip the above window and directly open all the plugins for a channel by right clicking the mouse on a channel’s green FX button. Cool! The secret with mastering bus compression (as opposed to individual track compression) is to go easy – cranking it up can impart wild and wacky feats of squashery, so tread lightly compresserhoppah. Notice in my settings above that the threshold knob is conservatively set around -2 dB, and the ratio is at 2:1. When the track is played, the gain reduction light only glows intermittently. If the reduction light is glowing solidly, you’re probably applying too much compression. I strongly recommend dialing the threshold knob back to get your ears accustomed to what “too much” sounds like. The idea is to even out the mix and “glue” things together for a subtly more professional sheen. Next I inserted a G-Sonique GSXL4070 EQ. Judging from the “Solid State Mix Equalizer” verbiage and its faux-brushed aluminum front panel, I suspect this is meant to emulate a megabuck Solid State Logic mixing console. I don’t find the choice of EQ plugin to be critical, but you probably want something with at least four bands and wide Q settings. Q? The crafty scientist in the Bond movies? Nope. “Q” refers to frequency bandwidth. Here’s an EQ 101 tangent, at no extra charge! If you set an EQ frequency control to 800 Hz, and boost it 10 dB, it’s not actually boosting only 800 Hz (this would actually be really undesirable, possibly inaudible, or potentially sound real weird). In reality, an EQ is boosting frequencies in the vicinity of 800 Hz as well. A wide Q setting means an EQ is affecting a wider swath of frequencies below and above the selected frequency, whereas a narrow Q setting affects frequencies closer to the selected frequency. In the real world, wide Q settings tend to sound natural and musical because of the more gradual nature of the cut or boost. This is good for generally boosting or cutting, as in “gee, this song needs more bass”, or, “gee this song sounds dull, let’s boost the highs”. Narrow Q settings, on the other hand, are handy if there’s a specific frequency that’s ringing obnoxiously (think of the “ping!” snare drum in every Red Hot Chili Peppers or 311 song. Nuke that guy somewhere around 600 Hz and now it’ll sound like a thick, non-pingy Van Halen snare drum, as every snare drum should, but that’s another post altogether). Narrow Q is also super useful in live sound situations for suppressing specific tones that are feeding back. Getting back to our regularly scheduled EQ programming, first I set the highpass filter to around 30Hz (HP switch on the left). This isn’t too critical, but 1) frequencies below 30Hz are pretty much in the rumbling garbage truck area and don’t sound like music, and 2) super low frequencies can confuse MP3 encoding algorithms. Next I punched things up a bit in the 100 Hz area with a wide Q setting. This particular mix needed a little more girth, but honestly I end up reducing low bass more often than I increase it in mastering. It’s a really good idea at this point to A/B your mix against a track of a similar genre. I can’t tell you how many times, upon critical listening, I’m surprised that a track will have far less bass or brightness than I remembered in my “mind’s ear”. Unless you have a really good idea of what mixes should sound like in your particular room on your monitors, use reference material. A quick aside about setting bass levels: I’ve met lots of folks who will stand in a particular area of a room when mixing (or even outside the room! ), because they find there’s more or less bass there. The reality is that their mixing environment is a mess, because these strong and weak areas are nodes of sound ringing in a poorly set up or too-small room (imagine the one note that’s super loud when you sing in the shower – this is the exact same thing, minus the water). If at all possible, don’t put your monitors directly in front of a wall or in a corner (and don’t put Baby there either, because no one puts Baby in a corner). Placing speakers adjacent to walls and corners wreaks havoc with bass response. Given that the drivers are facing the other direction, you wouldn’t think so, but sound waves couple with walls and corners in funny ways, making for an inaccurate depiction of bass energy. If at all possible, place monitors a couple feet from walls, firing down the longest dimension of the room. Back to my mastering EQ, I did a cut around 600 Hz to reduce the honk and boxiness that can live between 400 and 800 Hz. I also cut around 3000 Hz. I almost always cut here because 2000 – 4000 Hz is the infamous “icepick” zone that can hurt your ears. It’s no coincidence that people are designed this way, because that’s where the cry of a baby lives – so you’ll hear them howling, lest they become trapped under a deadly mobile or something along those lines (incidentally, I’d probably like babies better if they were equipped with a knob for attenuating this frequency area). I left the high frequencies untouched, but I frequently will use a high-shelf filter for a gentle boost above 10 kHz. This brings out super–high elements such as hi-hat and snare “fizz”, as well as vocal breathiness. Finally, I added a Kjaerhus Audio Classic Master Limiter. “Brickwall” limiters (or volume maximizers) are placed at the very end of the signal chain to achieve maximum volume before clipping (i.e., distorting). The idea is to keep the final signal as close to 0 dB (maximum level) as possible in an effort to make tracks sound “in your face.” This is also done if a track is intended for radio or TV, where it needs to compete with other tracks’ perceived volume (the idea being that you don’t want someone else’s song to appear louder than yours). Without debating the musicality of this, brickwall limiters do offer a final bit of punch and like most, the Kjaerhus Classic Master Limiter is very easy to use, with just one knob. As with a compressor, it works “in reverse”– when the threshold is dialed fully clockwise to zero, there’s no effect. As you reduce the threshold, its effect becomes more pronounced. 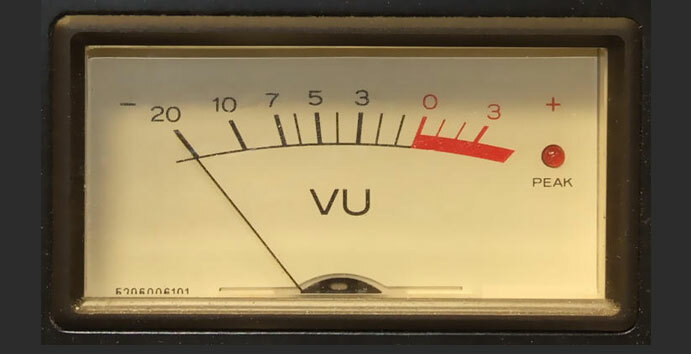 With most compressors and brickwall limiters, though the signal becomes thicker and denser as the threshold is reduced, the overall output volume decreases; there’s typically a “makeup gain” control to raise the signal back up to a usable level. In the case of the Kjaerhus Limiter, they’ve cleverly built this in. As the threshold knob is reduced (and limiting increases), makeup gain becomes louder, making it super easy to use. Though I’ve set it around -8 dB’s, the threshold setting greatly depends upon the loudness of the input signal. Rather than worry about a specific knob setting, it’s far better to set it with the reduction meter and your ears. As with most brickwall limiters, an average gain reduction of around 1-3 dB’s works well. Anything past that, and the sound becomes mushy and weird. Again, I recommend turning it up way too much (or down, in this case); this will train your ears better than anything I could write. I truly hope this series has helped you with recording and mixing. I’ll break down more tracks this way (in different styles, perhaps) in the future. As always, I encourage questions and comments! and making full use of the dvd in the book…. done a short demo about 4 week’s ago…..mixed down to wmv to window’s media player and burned it to dvd…..great result…. Quick question, I’m still working with Mixcraft 5.2, is there a way to update my plugins and filters, or just download more in general? Hi I cannot find the download link for the intermission project. Is this still available, would like to use this as a learning project etc and to experiment.